Do you watch Shark Tank? This past Friday there was a company called plated on the show. Plated is a service that will deliver fresh, locally grown ingredients right to your front door, along with a full-color, easy-to-follow recipe card so that you can turn those ingredients into a delicious home-cooked meal in 30 to 40 minutes. On the show, most of the Sharks didn't really seem to get it. They asked questions like, "Why would someone want to order food that they still had to cook?" 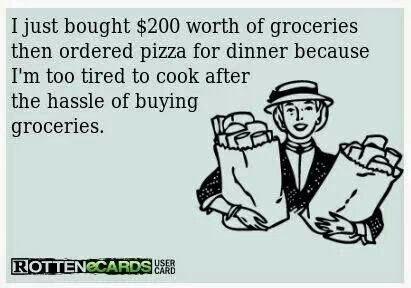 and, "Someone who cooks can just go to the grocery store." Personally, I think it's a great idea. I think there are a lot of people who would like to be able to provide delicious and healthy home-cooked meals for their families, but they just don't know where or how to start. It can't get easier than having all the ingredients delivered straight to your door along with step-by-step directions. I do cook, and I do go to the grocery store, but I've been browsing through the menus available for delivery in my area next week, and there are some amazing-looking dishes. Sometimes the hardest thing about fixing dinner is deciding what to have for dinner. Plated has full-color pictures along with a list of everything they will send for each dish, and all you have to do is choose the ones that look good to you. A lot of these menus include ingredients I don't ordinarily buy, so this would be a good way to try something new, without ending up with a whole lot of extra stuff I won't know what to do with - like when I buy eggplant. I always end up buying it and then letting it go to waste because I don't know what to do with it. The ingredients for the plated.com meals are packed fresh and pre-portioned to cut back on waste. So, I can see this service being very handy for both people who want to start cooking at home and for those of us who do cook but want to try something new, perhaps for a special occasion. The meals cost $15/plate (or $12/plate with a membership) with a minimum 4 plate order, so they're not exactly cheap, but they really don't cost more than going out to a restaurant - and they're fresh and home-cooked. Be sure to check it out and see what they have for you. For a limited time, save 30% off your order at plated.com by using the code SharkPlated30 at checkout - through 4/18/14. Chunky Apple Cinnamon Muffins w/ Crumb Topping - apples in the topping! And there were many more! Meanwhile, heat the oil in a large fry pan and cook onion and chicken over a medium-high heat for 6-8 minutes, until the onion is soft and the chicken is starting to brown. Add the mushrooms and spinach and cook until spinach starts to wilt. Season with dried parsley and salt & pepper. Pour in the stock and simmer for 10-15 minutes, until the chicken is cooked through. Stir in the corn and sour cream. Season with additional salt & pepper if needed. When potatoes are cooked, drain and mash them with the butter (or extra sour cream or creme fraiche) Season with salt and pepper. 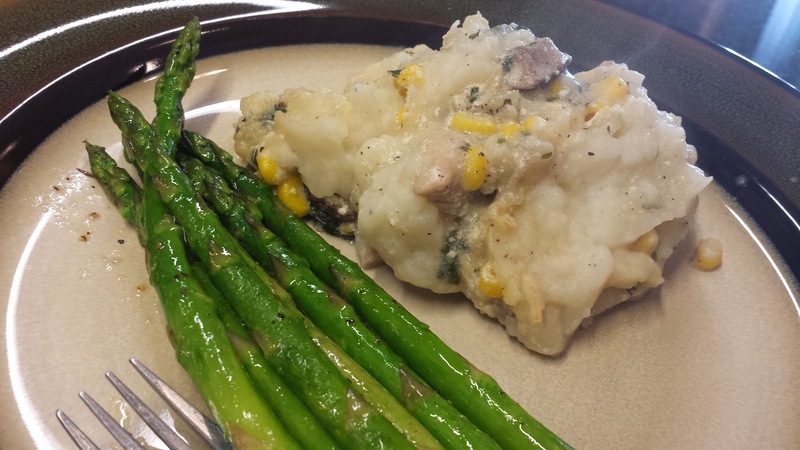 Heat oven to 400° F. Spoon the chicken mixture into a medium baking dish; top with the mashed potatoes, sprinkle with a bit of additional parsley, and bake for 20-25 minutes until golden brown and bubbly. The chicken and corn mixture was soupier than I was expecting when I put it in the baking dish, and the potatoes were quite thick on top. Then, the oven worked its magic, and they baked together into this perfectly creamy delicious dish that my husband and I both loved. 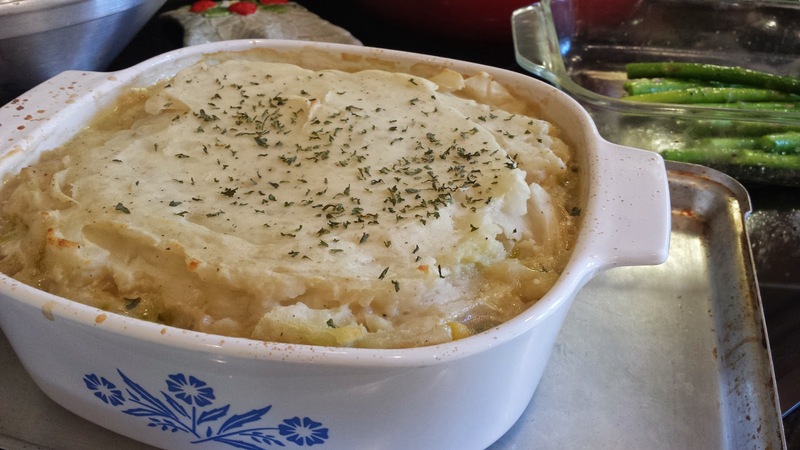 When I decided to make this particular recipe, I had to look up Cottage Pie, too. Leigh says this is not the sort of cottage pie her mum would make, which would be "an Irish or British meat pie cooked with beef mince and has a crust made from mashed potato" - and certainly not chicken. Or corn. 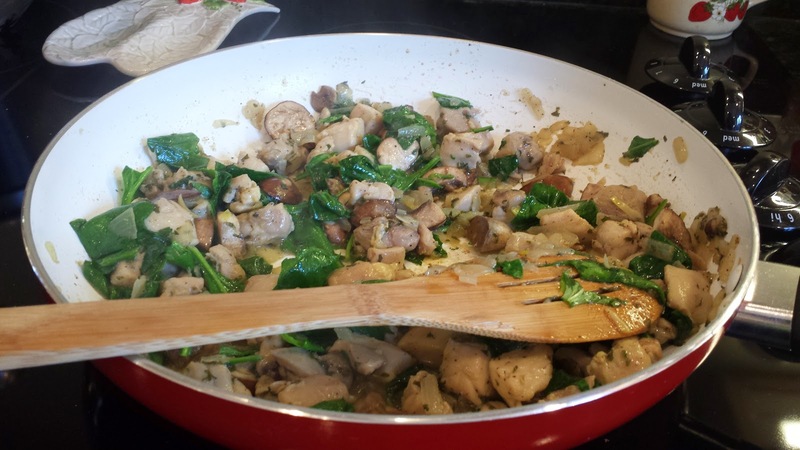 Well, this one has both, and I added some mushrooms and spinach too, just because, and it is yummy. Definitely comfort food.